Agave parryi var. truncata in the Ruth Bancroft Garden. 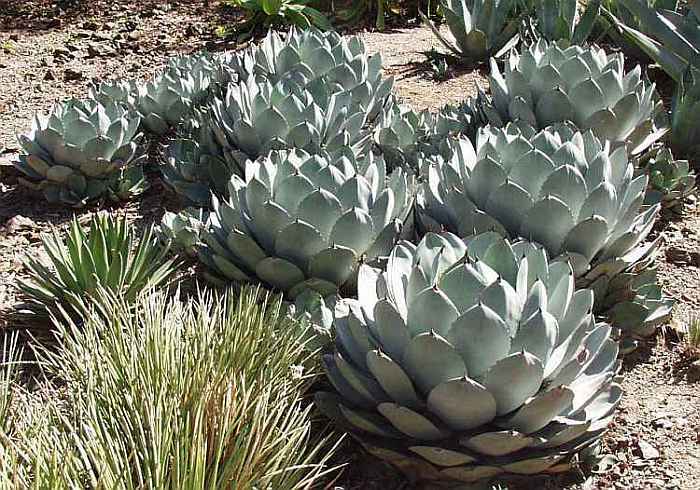 On April 9, 2004 the Ruth Bancroft Garden hosted a "Dry Garden Design Seminar" titled "Aloes, Agaves, Aeoniums, Oh My! : Far-Out Succulents for the Summer-dry Garden". The seminars, co-sponsored by The Garden Conservancy, were very informative and it was also a great time to network with growers attending the talks and then later while touring the Ruth Bancroft Garden. The talks, which were held in the Civic Arts Building in Walnut Creek, started off with Ruth Bancroft Garden Plant Curator and Assistant Garden Director, Brian Kemble who gave a talk titled "Aloes & Agaves: Bold Forms & Garden Presence". He also handed out his great list of Hardy Aloes. Next Dr. Dean Kelch, Research Associate at the UC Berkeley Herbarium and Garden Director of the Ruth Bancroft Garden spoke on "Aeoniums & Crassula: The Tapestries of Color" followed Roger Raiche, one of California's finest garden gurus and co-owner of Planet Horticulture. Roger shared his design ideas and showed pictures of both his well established Maybeck cottage garden in Berkeley and his new plantings at Gold Leaf Vineyards in Sebastopol, CA. Ken Druse wrote Moving Lock, Stock and Trowel on the decision and process that Roger Raich and David McCrory went through in making the move from what many considered to be the best garden on the west coast. After Roger's talk we were ready for lunch which was followed by a talk by Isis Spinola-Schwartz of Schwartz and Associates of Mill Valley who spoke on her use of succulents in her landscape designs. We then had a short question and answer period and then we all headed over to the Ruth Bancroft Garden for a tour of the gardens and to conduct the "Agave Summit".